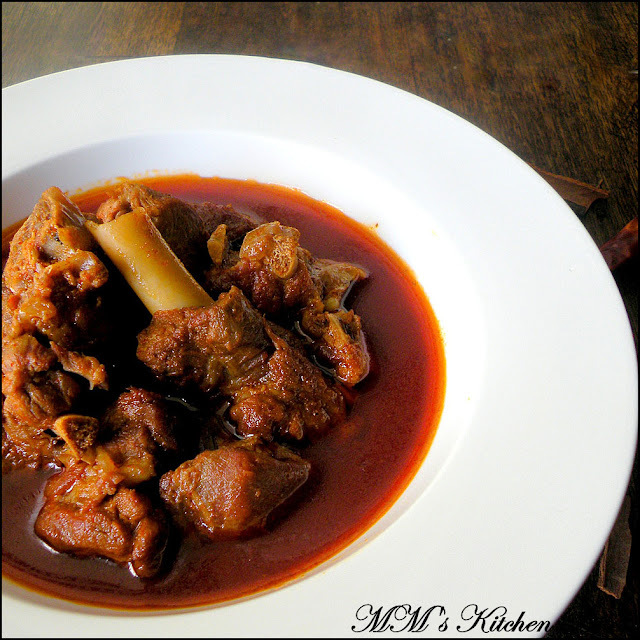 MM's Kitchen Bites: Rogan Josh/ Lamb in red gravy (Kahmiri Pandit style)…Colour me Red!!! 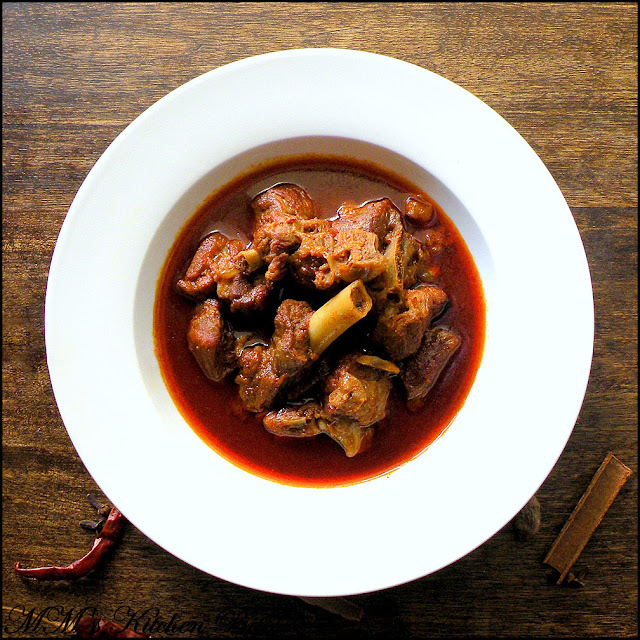 Kashmiri Rogan Josh is typically made with Lamb meat but that is tough to source here so I substitute with Mutton i.e. goat meat. Ideally should be made with pieces on the bone as meat on the bone adds flavor to the curry but if boneless is what you prefer, please go ahead and use that. Whisk the yogurt well and ensure it is at room temperature. Heat oil in a wide heavy bottom pan. (if using mustard oil, please do smoke and then cool the oil first; if using ghee or any other oil , please don’t let it smoke). Add asafoetida, cloves, black cardamom and cinnamon. Let the spices sizzle and flavour the oil for about 10-15 seconds. Increase the heat to high and add in the meat. We need to let the meat brown on all sides – don’t stir around too much, let it brown on one side for 2-3 minutes before flipping it over to brown on the other side. Once the meat is nice and brown on all sides, lower the heat and add the yogurt. Mix and stir well till the yogurt almost evaporates. Once the oil starts to separate, add dry ginger powder and fennel seed powder. Stir well and add a cup of water. Increase the heat and let the water come to a boil. Once it boils, add salt and lower the heat again. Cover and cook on low flame till the meat is tender and you can see a layer of oil separated from the gravy.Cooking time will depend on the quality of the meat – for the meat that we get here, takes about an hour for meat on the bone and about half an hour for boneless meat. Do remember to stir occasionally to ensure the spices don’t stick to the bottom of the pan. And when you open the cover to give a stir, add some hot boiling water if you think it is getting too dry. Add the crushed green cardamoms and cumin powder, mix well. Let it simmer for a couple of minutes. Wowo super delicious looking. We get lamb but we don't get goat and i think this dish one had to make with goat. Wish i had this with rice or roties. wow ,it looks so fabulous,sema clicks .it is really tempting. this looks simply superb ! I've been searching for a recipe for Rogan Josh will give this a shot ! Lovely Clicks ! Wow, so many versions of this recipe!! Must be great tasting..
were is the ratanjot is added in this recepe ? I didn't use ratanjot, as it is not a must ingredient for Rogan Josh. It is used only to five a bright red color to the Rogan Josh but has nothing to do with any flavor. Moreover, it is carcinogenic - would strongly suggest that you avoid using it.